I bought this online with the intention of sharing it here. I’ve typed the copy up for easier reading. Enjoy! If there is anything that people are more fastidious about than the food they eat, it is the environment in which it is served. Because of this fact the modern Jerry O’Mahony dining car fulfils one of the most insistent demands of the general public. A modern Jerry O’Mahony dining car is more than just a casual eating place, – it’s the kind of place that people enthuse about and return to frequently. 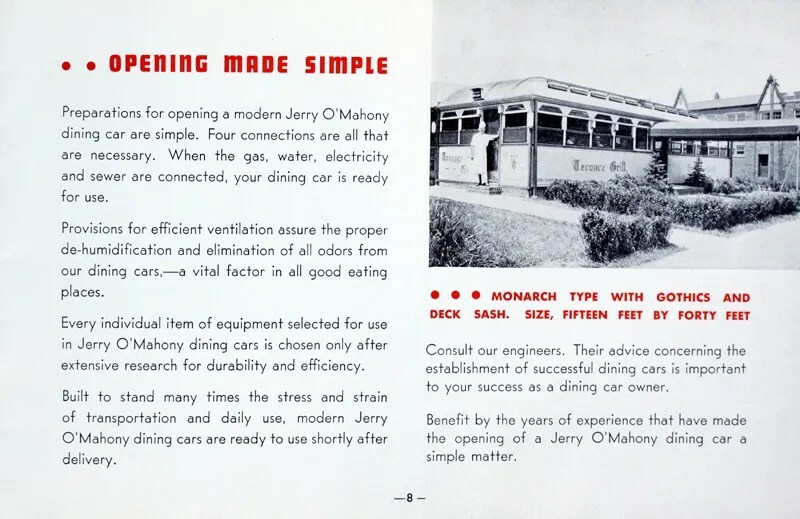 Public approval of Jerry O’Mahony dining cars is more than a passing fad. The fact that the dining car offers its guests rapid service, cleanliness, comfort, and an opportunity to see the food prepared, justifies the rapid rate of increase in dining car patronage. Jerry O’Mahony dining cars are recognized by every community as a distinct addition to their particular neighbourhood. 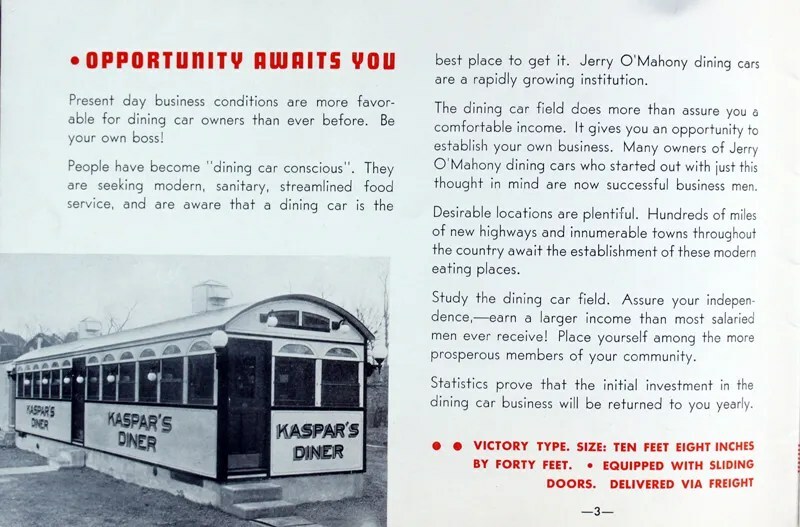 Owners of Jerry O’Mahony dining cars are prosperous business men. Proven figures show them to have an actual net income of $5,000 – $10,000 per year. 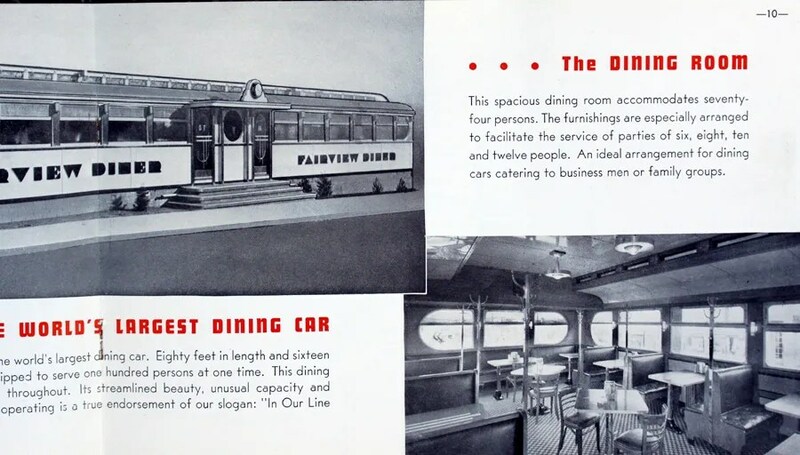 The success of the modern dining car is firmly established. Take advantage of this opportunity to attain financial independence. Present day business conditions are more favourable for dining car owners than ever before. Be your own boss! People have become “dining car conscious”. They are seeking modern, sanitary, streamlined food service, and are aware that a dining car is the best place to get it. 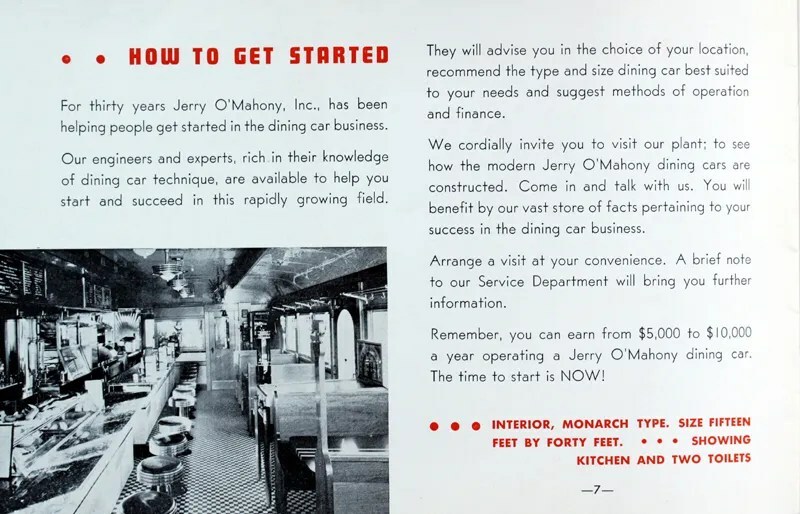 Jerry O’Mahony dining cars are a rapidly growing institution. The dining car field does more than assure you a comfortable income. It gives you an opportunity to establish your own business. Many owners of Jerry O’Mahony dining cars who started out with just this thought in mind are now successful business men. Desirable locations are plentiful. Hundreds of miles of new highways and innumerable towns throughout the country await the establishment of these modern eating places. Study the dining car field. Assure your independence; – earn a larger income than most salaried men ever receive! Place yourself among the more prosperous members of your community. Statistics prove that the initial investment in the dining car business will be returned to you yearly. 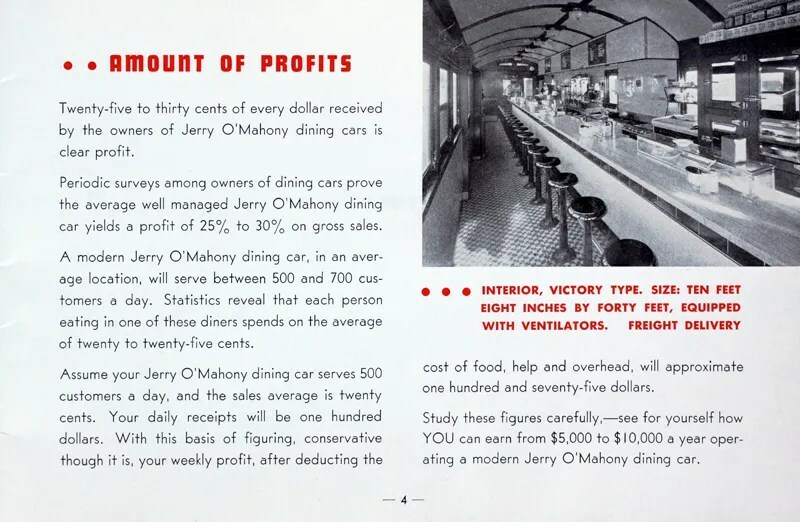 Twenty-five to thirty cents of every dollar received by the owners of Jerry O’Mahony dining cars is clear profit. Periodic surveys among owners of dining cars prove the average well managed Jerry O’Mahony dining car yields a profit of 25% to 30% on gross sales. 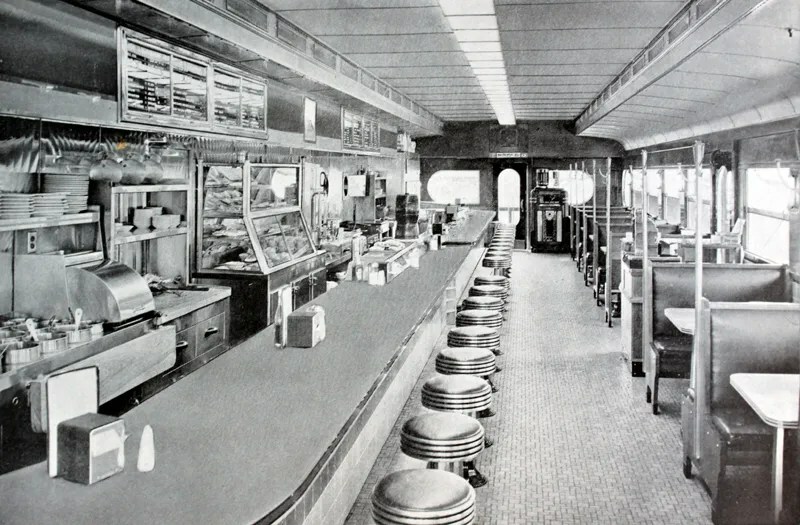 A modern Jerry O’Mahony dining car, in an average location, will serve between 500 and 700 customers a day. Statistics reveal that each person eating in one of these diners spends on the average of twenty to twenty-five cents. Assume your Jerry O’Mahony dining car serves 500 customers a day, and the sales average is twenty cents. Your daily receipts will be one hundred dollars. With this basis of figuring, conservative though it is, your weekly profit, after deducting the cost of food, help, and overhead, will approximate one hundred and seventy-five dollars. Study these figures carefully, – see for yourself how YOU can earn $5,000 to $10,000 a year operating a modern Jerry O’Mahony dining car. A small amount of capital will establish you as the owner of a prosperous dining car business. Many competent people, ambitious to start businesses of their own, are handicapped by the lack of sufficient cash. The Jerry O’Mahony Purchase Plan is a straight-forward arrangement of deferred payments, so regulated that you, as a good operator, can easily make the payments out of your dining car’s profit without working any hardship upon yourself. You pay as you earn, and after a short time you become the sole owner of a highly profitable dining car business. The dining car pays for itself. 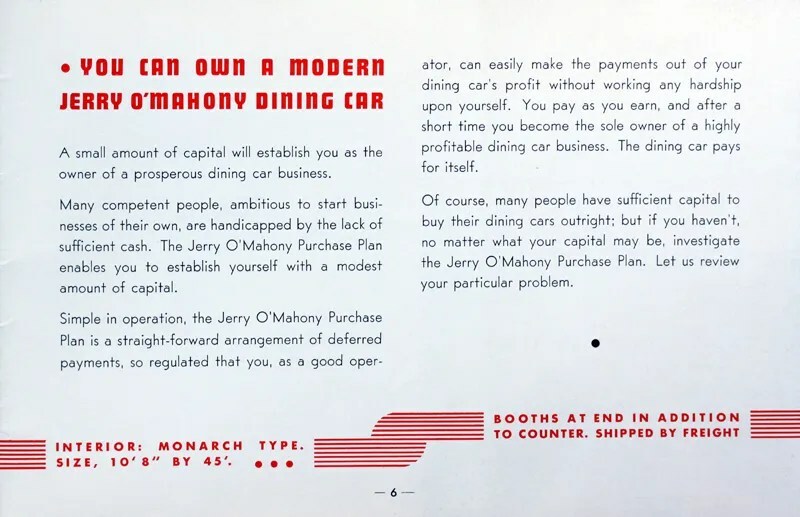 Of course, many people have sufficient capital to buy their dining cars outright; but if you haven’t, no matter what your capital may be, investigate the Jerry O’Mahony purchase plan. Let us review your particular problem. For thirty years Jerry O’Mahony, Inc., has been helping people get started in the dining car business. Our engineers and experts, rich in their knowledge of dining car technique, are available to help you start and succeed in this rapidly growing field. They will advise you in the choice of your location, recommend the type and size dining car best suited to your needs and suggest methods of operation and finance. We cordially invite you to visit our plant to see how the modern Jerry O’Mahony dining cars are constructed. Come in and talk with us. You will benefit by our vast store of facts pertaining to your success in the dining car business. Arrange a visit at your convenience. A brief note to our Service Department will bring you further information. 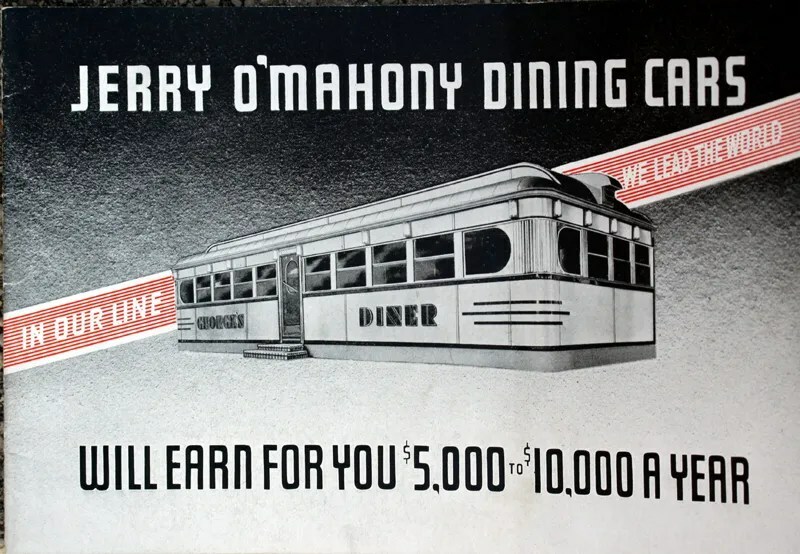 Remember, you can earn from $5,000 to $10,000 a year operating a Jerry O’Mahony dining car. The time to start is NOW! Preparations for opening a modern Jerry O’Mahony dining car are simple. Four connections are all that are necessary. When the gas, water, electricity and sewer are connected, your dining car is ready for use. 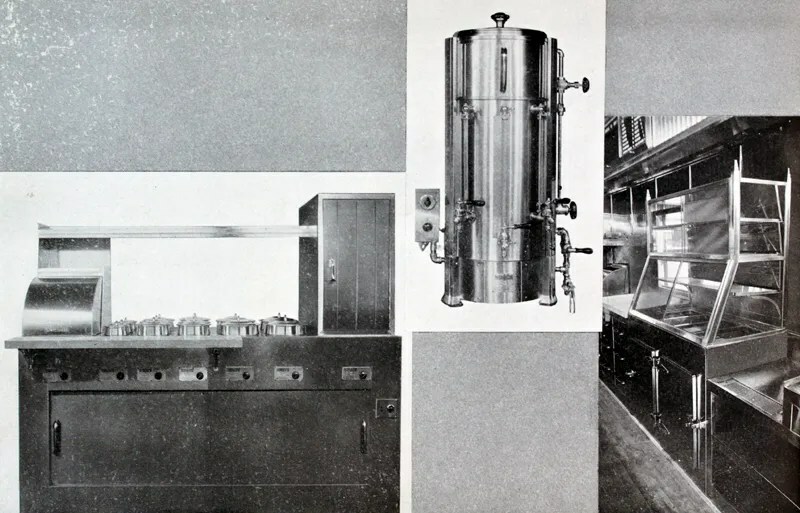 Provisions for efficient ventilation assure the proper de-humidification and elimination of all odors from our dining cars, – a vital factor in all good eating places. 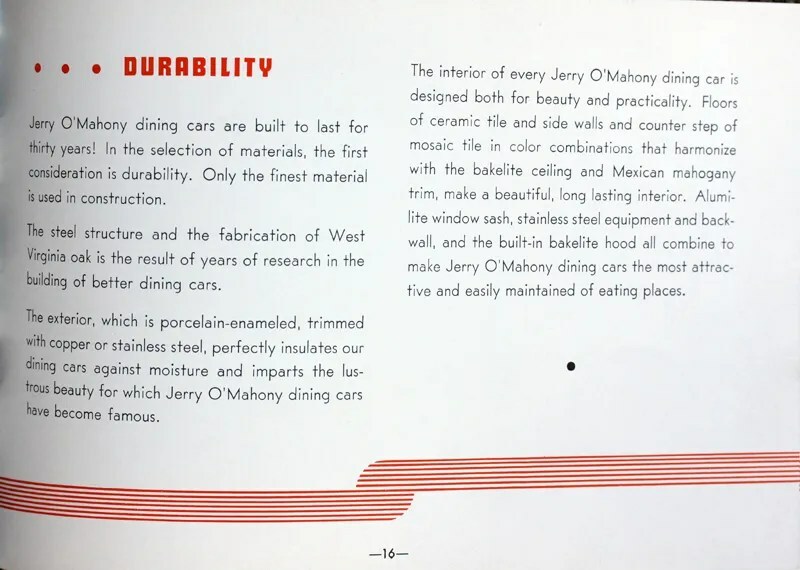 Every individual item of equipment selected for use in Jerry O’Mahony dining cars is chosen only after extensive research for durability and efficiency. Built to stand many times the stress and strain of transportation and daily use, modern Jerry O’Mahony dining cars are ready to use shortly after delivery. Consult our engineers. Their advice concerning the establishment of successful dining cars is important to your success as a dining car owner. Benefit by the years of experience that have mad the opening of a Jerry O’Mahony dining car a simple matter. The counter and boots are modern in every detail. 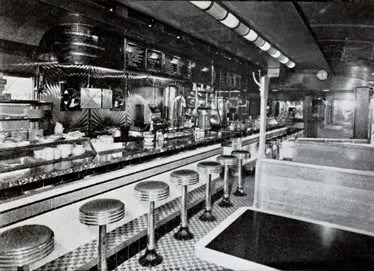 The counter provides seats for twenty-six customers. Seventy- four may be comfortably seated in booths. The efficient arrangement of the modern equipment in the back bar speeds service throughout the dining car. This spacious dining room accommodates seventy-four persons. The furnishings are especially arranged to facilitate the service of parties of six, eight, ten and twelve people. An ideal arrangement for dining cars catering to business men or family groups. Jerry O’Mahony, Inc., builds dining cars to meet every individual requirement. 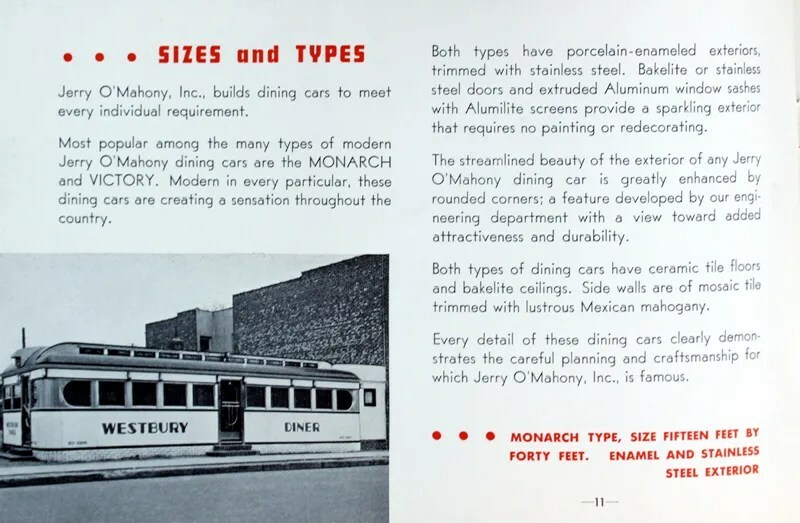 Most popular among the many types of modern Jerry O’Mahony dining cars are the MONARCH and VICTORY. Modern in every particular, these dining cars are creating a sensation throughout the country. Both types have porcelain-enameled exteriors, trimmed with stainless steel. Bakelite or stainless steel doors and extruded Aluminum window sashes with Alumilite screens provide a sparkling exterior that requires no painting or redecorating. The streamlined beauty of the exterior of any Jerry O’Mahony dining car is greatly enhanced by rounded corners; a feature developed by our engineering department with a view toward added attractiveness and durability. Both types of dining cars have ceramic tile floors and Bakelite ceilings. Side walls are of mosaic tile trimmed with lustrous Mexican mahogany. Every detail of these dining cars clearly demonstrates the careful planning and craftsmanship for which Jerry O’Mahony, Inc., is famous. Jerry O’Mahony dining cars embody more than just the practical equipment for food service. They have an appealing architecture and a distinctive design which is attractive and will remain so throughout the years. Our designers carefully avoid the dangerous extremes of fads, favouring always the lines and decorative mediums which are of lasting good taste. 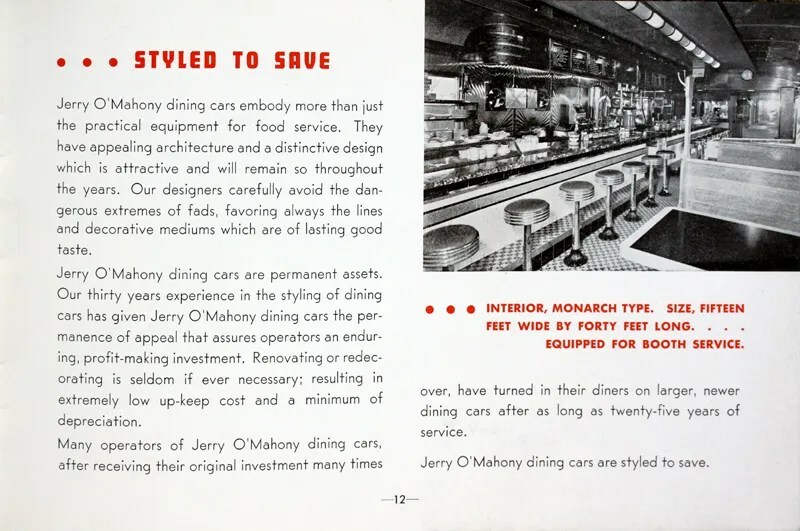 Jerry O’Mahony dining cars are permanent assets. Our thirty years experience in the styling of dining cars has given Jerry O’Mahony dining cars the permanence of appeal that assures operators an enduring, profit-making investment. Renovating or redecorating is seldom if ever necessary; resulting in extremely low up-keel cost and a minimum of depreciation. Many operators of Jerry O’Mahony dining cars, after receiving their original investment many times over, have turned in their diners on larger, newer dining cars after as long as twenty-five years of service. Jerry O’Mahony dining cars are styled to save. 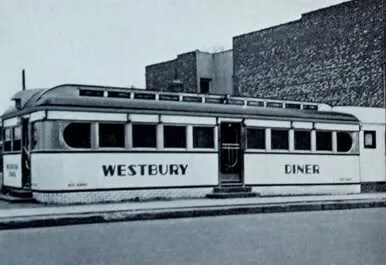 There’s the Westbury diner in the foreground, I’d assume it’s the same diner as this one. Also identifiable is the Franklin Diner. Note the rounded corner monarchs and the squared corner, stained glass windowed monarchs side by side. Jerry O’Mahony, Inc. Operates the largest, most up-to-the-minute dining car factory in the world. 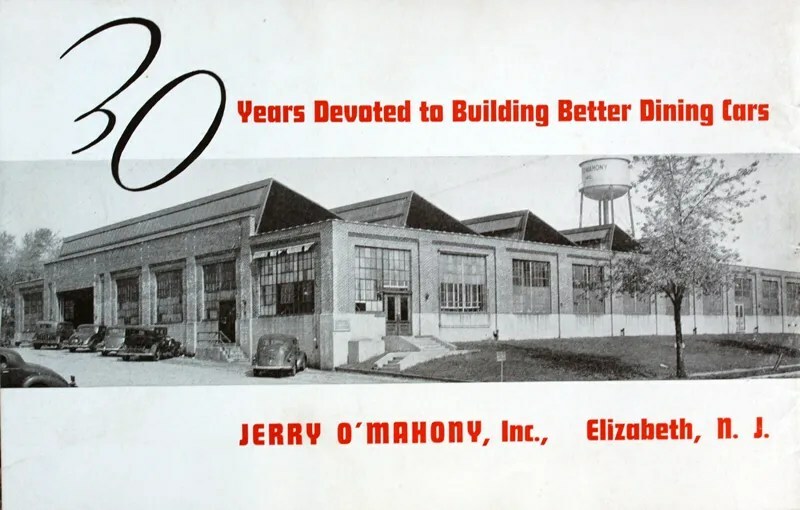 Large though our plant is, all building operations are so co-ordinated that every detail in the construction of a Jerry O’Mahony dining car is carefully supervised by one of the founders of this firm. 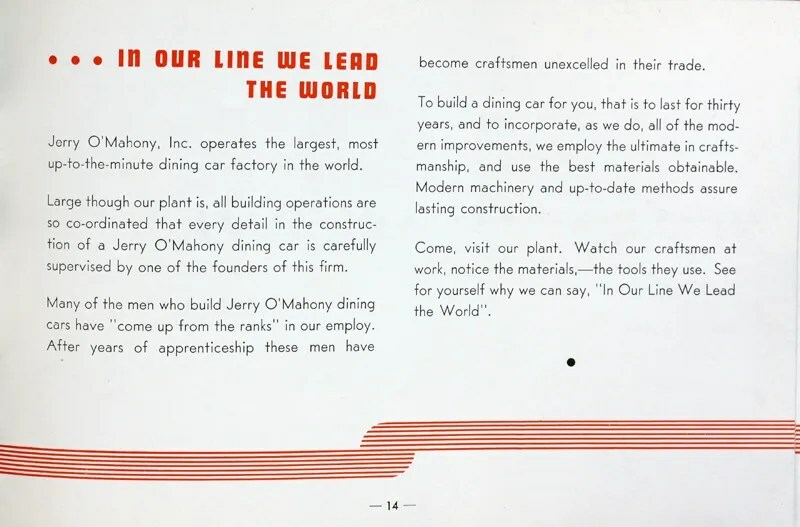 Many of the men who build Jerry O’Mahony dining cars have “come up from the ranks” in our employ. After years of apprenticeship these men have become craftsmen unexcelled in their trade. To build a dining car for you, that is to last for thirty years, and to incorporate, as we do, all of the modern improvements, we employ the ultimate in craftsmanship, and use the best materials obtainable. Modern machinery and up-to-date methods assure lasting construction. Come, visit our plant. Watch our craftsmen at work, notice the materials, – the tools they use. See for yourself why we can say, “In Our Line We Lead the World”. Jerry O’Mahony dining cars are built to last for thirty years! In the selection of materials, the first consideration is durability. Only the finest material is used in construction. 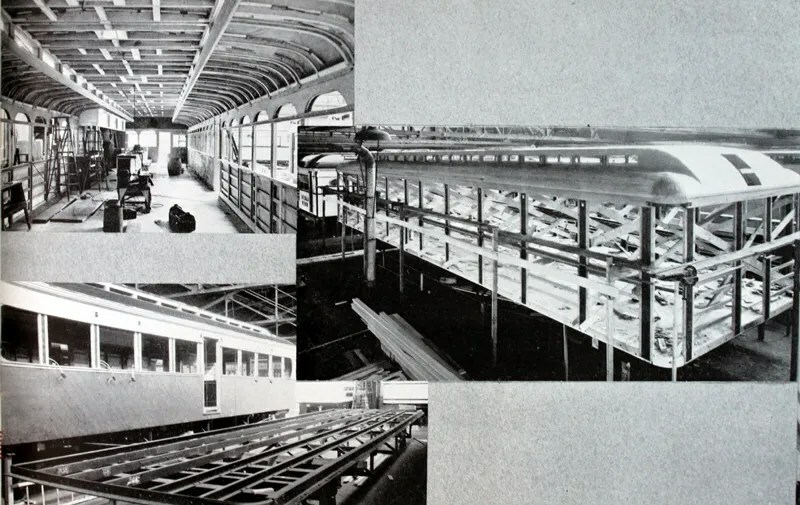 The steel structure and the fabrication of West Virginian oak is the result of years of research in the building of better dining cars. The exterior, which is porcelain-enameled, trimmed with copper or stainless steel, perfectly insulates our dining cars against moisture and imparts the lustrous beauty for which jerry O’Mahony dining cars have become famous. The interior of every Jerry O’Mahony dining car is designed both for beauty and practicality. Floors of ceramic tile and side walls and counter step of mosaic tile in color combinations that harmonize with the Bakelite ceiling and Mexican mahogany trim, make a beautiful, long lasting interior. Alumilite window sash, stainless steel equipment and backwall, and the built in Bakelite hood all combine to make Jerry O’Mahony dining cars the most attractive and easily maintained of eating places. Coffee is your most important item. With this in view we have designed an economical, automatic coffee maker that achieves the ultimate in the consistent brewing of good coffee. The self controlled features and our drip system assure the brewing of good coffee at all times, with a minimum of effort. This coffee maker is thermostatically controlled. 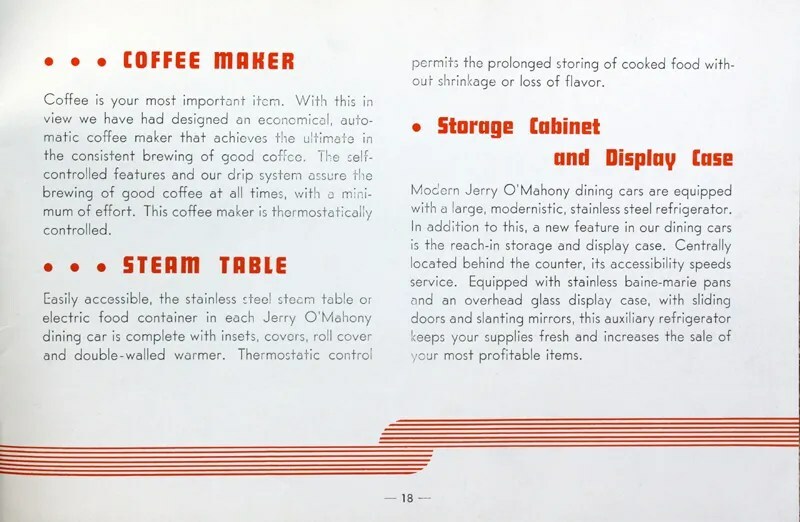 Easily accessible, the stainless steel steam table or electric food container in each Jerry O’Mahony dining car is complete with insets, covers, roll cover and double-walled warmer. Thermostatic control permits the prolonged storing of cooked food without shrinkage or loss of flavour. Modern Jerry O’Mahony dining cars are equipped with a large, modernistic, stainless steel refrigerator. In addition to this, a new feature in our dining cars is the reach-in storage and display case. Centrally located behind the counter, its accessibility speeds service. Equipped with stainless baine-marie pans and an overhead glass display case, with sliding doors and slanting mirrors, this auxiliary refrigerator keeps your supplies fresh and increases the sale of your most profitable items. O’Mahony was founded in 1913, so celebrating 30 years would date this to c. 1943. Some closeups from other pages If you have any idea as to where any of these diners were located, or if any are still around, please comment. Barrel roofed “Victory” model. Older style stools, and a sliding door. 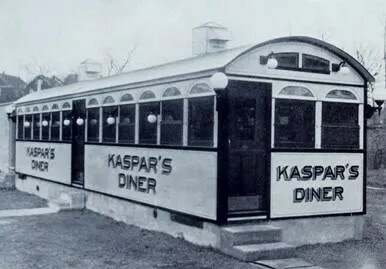 I wonder what the actual date of manufacture of this particular diner was. Interesting that this barrel roofed style with the skylight vents on the roof, that is so associated with 1920s and early 1930s diner style is still offered in the early 1940s. The terrace grill, a square cornered monarch model. Interesting that they’re advertising this older style monarch alongside the newer, streamlined one. I wonder how the demand for this type was at the point the brochure was published. 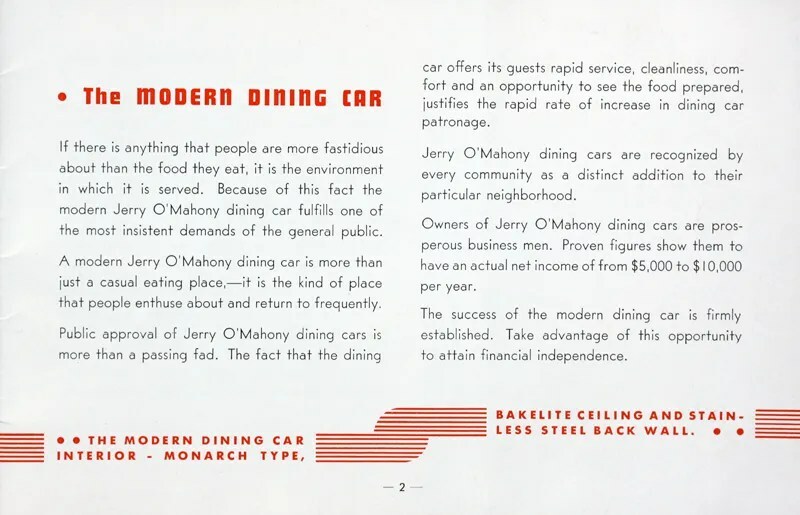 It seems that the monarch name is used exclusively now to describe O’Mahony’s like this one, but the way the copy is worded here, it seems more like monarch was O’Mahony’s general model name for any monitor roof diner they produced, while “victory” was the model name for their barrel roof models. 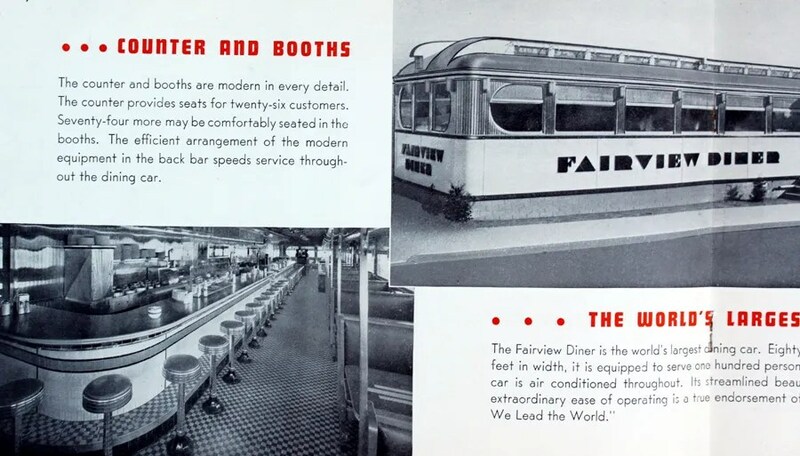 This entry was posted in Diners / roadside related, Diners/ restaurants, Jerry O'Mahony, Inc., Roadside attraction and tagged 1930s, aluminum, art deco, bakelite, Booth Service, coffee, diner, diner company, diner manufacturer, dining car, dining car company, Elizabeth, elizabeth New Jersey, factory, fairview diner, franklin diner, George's Diner, in our line we lead the world, Jerry O'Mahony, juke box, Kaspar's diner, kellogg's corn flakes, mexican, modern, monarch, New Jersey, old, pamphlet, Porcelain Enamel, prewar, restaurant, sales pitch, sanitary, stainless steel, streamline, Terrace Grill, victory, Vintage, westbury diner by Spencer Stewart. Bookmark the permalink. After having a brief view through this page about american diners, i felt it within myself to contact you about a diner that we have here in Ashford, Kent, UK. 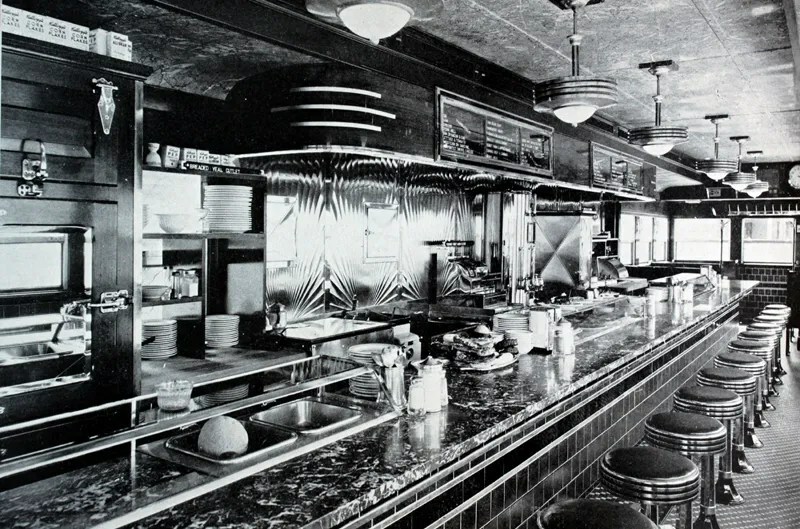 The website included in this message has an interview at the diner and displays images of this remarkable classic which has still functions as a working diner. 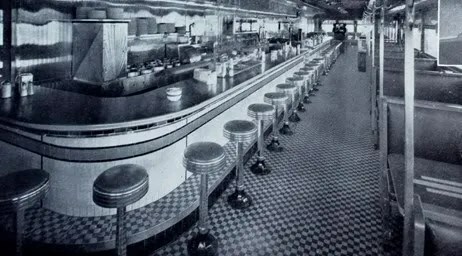 The Riverview Diner was built in Elisabeth, New Jersey by the Jerry O’Mahoney Diner Manufacturing Company in 1941. It was shipped to Harrisberg. Pennsylvania in the summer of 1941. The Riverview Diner could be located on the river road, along the bank of the Susquehanna River. In 1990 it went through$ restoration in Maine and was passed through several owners for some years. The current owner of the Riverview Diner obtained it from storage in London in 2000 and was opened in 2002 and has been at the Bybrook Barn Garden Centre since. After seeing your interest in diners I though I would bring it to your attention that a great classic piece of american history can now be located in working order in the UK. Many thanks for the posting. My great uncle was Jerry O’Mahony and my grandfather Daniel A. Mahoney (he dropped the O and added an e) was his partner for 7 years. My grandfather pursued real estate while he continued to sell diners. He used to tell me he would start out from some major city like Philadelphia and when he got hungry he would start to search for a site for a diner. Now that is gut level market research. I have 3 benches and 3 tables from a O’Mahoney dining car installed in my store in cornwall, ct. one of the tables is still freestanding and in its original condition, minus the pinstriping on the table edge. The 3 booths sections, one middle and 2 end, and the other 2 tables have had one leg cut off to be wall mountable. I was wondering if there were alot of these booths around, except for the ones in the half dozen or so existing diners themselves. These booths were taken out of an O’Mahoney diner in New Hampshire in 1997 from what I have been able to find out. 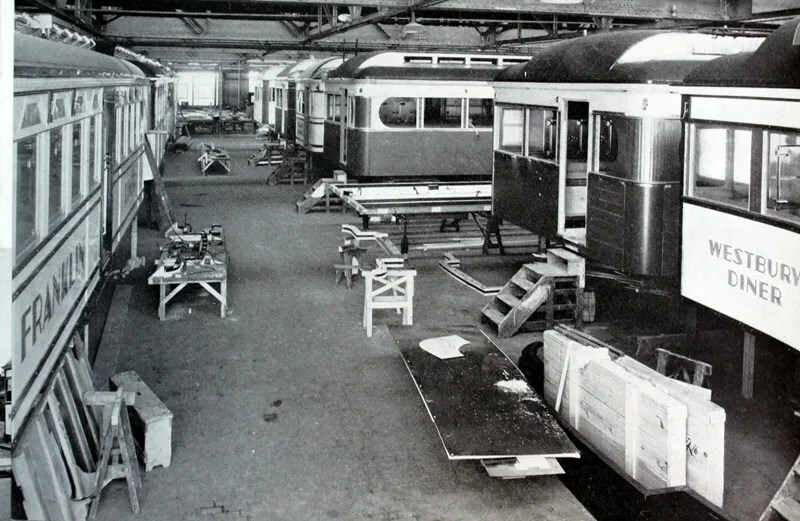 We are presently restoring a 1938 Jerry O’Mahony diner car for the Lincoln Highway Heritage Corridor (route 30). Would love to see some close up pictures of your table and seating as ours is missing. Please respond and thank you for your time. Not that I know of. Once a fixture is removed from a diner, there’s really no way of knowing where it is or of keeping track of how many are in existence. I’d love to see pictures if it’s not too much trouble sending them along. That could help date them, and find which diner they came from. 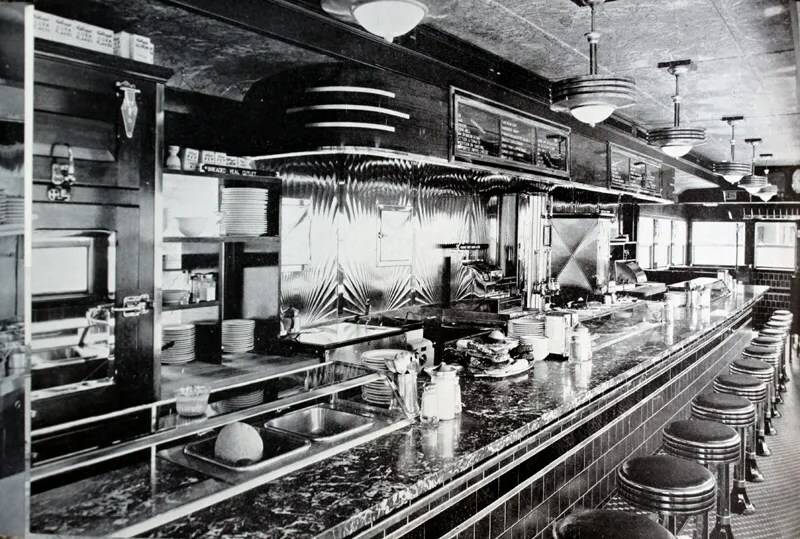 Nice photos of a time gone by when diners meant more to the American way of life. My company, Modular Diners, is working to bring back those days with our factory-built, all steel and concrete stainless steel retro diners. Even though they meet modern building codes, they still have the heart of the good old retro diners. Go to www. modulardiners.com and fill out a Contact Form. I will send you information on our retro diners. Aller à www. le modulardiners com et remplit une Forme de Contact. Je vous enverrai les informations sur nos dîneurs rétro. Send it here- they don’t get posted automatically. It is in Wakefield Rhode Island on Main St. It looks like a O’Mahony Diner. The info I have on that one says its an O’Mahony from around 1936. I am going to do a little local research and will let you know the result. 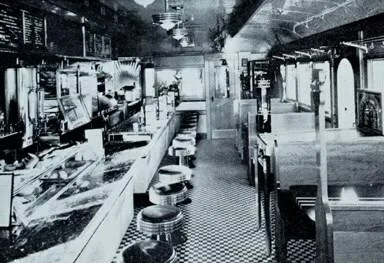 I have had my bid accepted to restore an 1938 O’ Mahony Diner Car. We have a major full restoration on our hands. I am searching for any info on these cars. I am looking for parts, brochures, descriptions, pictures, manufacturers of parts, etc. If anyone could give me a hand would be greatly appreciated. Which diner are you doing the restoration on? This pamphlet is all that I have as far as original promotional material is concerned. I have sources for items you may need in your restoration. Send me a list and I will try to help as best I can. Okay. I am trying to find the correct wall sconce for the Interior and Exterior. I am hoping that someone has pictures or has one to sell me for me to make molds. I also need to know the correct strip light down the center on ceiling. Also the windows, wanted to know if anyone knows where i might be able to buy some. I am looking for a clock. I was wondering if the 1938 had mahogany doors on freezer box or was that an option? What was originally on the ceiling, was it a Bakelite product or what? I have got my hands full. I am really hoping that someone might be able to turn me in the right direction. I am also looking for some orange ceramic tile, black cove base tile, and the black tile right under the window and some of the floor mosaic tile. Any help from anyone would be so appreciated. We are also honoring people that sell or supply us with any items installed in diner. We are going to put something in the paper and we are going to a documentary on the project. I am setting up video cameras for people to track the progress. This is going to be fun. Check out http://www.classsicillumination.com, Phil Waen. They should have what you want. I’m looking for wall tile to restore our 1939 O’Mahoney Diner. It’s Wheeling tile, in a mottled grey/white. Any sources for other items would be very welcome also. Hi Michele, The tile you seek was a popular 30’s style of which I haven’t found anyone capable of reproducing. It was basically a grey ceramic tile which was acid washed to get the white “splotchy” effect. How much do you need? I do have some in inventory. I’m looking for ~50 pieces. How many do you have and what is the price? Would you also be able to send me a picture, so that I can be sure that it matches? I’m also looking for a curved, ridged, glass block for the lighted vertical strip along the counter entry. The bottom one on one side is shattered. Thanks & looking forward to hearing back from you! Michele, I’ll check inventory to see how many I have, I’ll take a photo when I check inventory. Not sure if I can attach a pic through this forum. I’ll let you know. ps: I don’t visit the email client for this forum very often. Hi Michele, I did a quick inventory and have at least 60 tiles. They are 4.25 X 4.25 inch square. I took photos but there is no option to attach them w/ this comment. The man standing at the door of the Terrace Grill in brochure picture is my grandfather John Pucek. 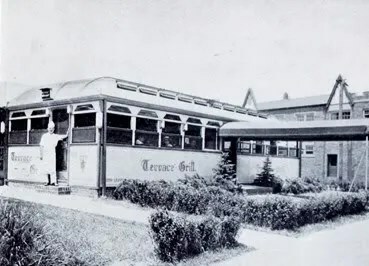 Terrace Grill was in Palisades Park NJ. He owned mult. diners from long island to virginia. Hi, I’m a waitress at Bishop’s 4th St Diner in Newport, RI, and I’d like to find out more about the history of the building itself. I know that it’s an O’Mahony Monarch model, but I’d like to know exactly when it was built and what it’s original layout was like. I’ve asked the owner what she knows of the story, but she has only vague knowledge of the restaurant’s history before she bought it 12 years ago. Do you know of any sources where I could trace the history of the building from its origins in NJ? I know that it was located in Seekonk, MA before being moved to Newport in 1967. It’s not much to go on, but I thought you might have a better idea of where to look than I do. Thanks for any help! It’s definitely an O’Mahony, though I don’t know if by that point the company was using the “Monarch” designation. 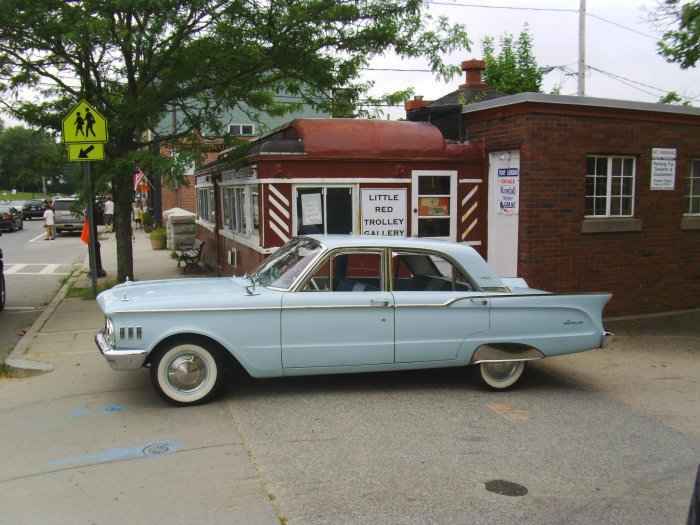 It was built in 1952 in New Jersey, put on a truck and moved to MA. I have it down as originally being in Swansea, MA, but Swansea and Seekonk are right down the road from each other. Older photos I’ve seen of it have it with red stripes instead of the current blue. Other than that, I don’t have much else to add. Travis, I sent you photos and descriptions of the wall sconces, exterior light sconces and ceiling light fixtures as requested. I am surprised you;re still looking for them. I have a handfull of original O’Mahony sconces as well as other parts we’ve salvaged or reproduced for our manyt restoration projects. Hows everything? I believe i only got one set of pictures from you. 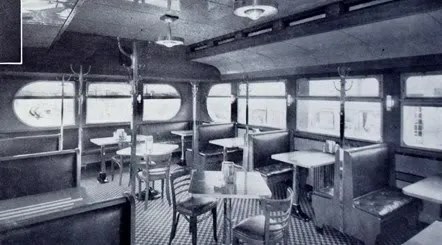 Our diner car was a early 1938 Mahony. The late 38’s and beyond have the wall sconces with frosted glass looking to be fluted as well. Also they had square bars in front of the glass. Late 1938 they started ramping up for the worlds fair model. That was when they were changing everything. We know ours was the early model because the ends of the car were still square and the end windows were square. If you do have any lights that you are sure will work or you have pictures please let me know. We have been doing sketches of the early exterior sconces as well. Do you have any recommendation as to where i might find someone that will make some windows? Thanks for your help. Any and all is appreciated. I will have to keep you upto date with our progress and pics. Its been fun but trialsome as well. I can’t say I know much about these; however I just took a road trip through upstate NY (I’m from NJ, not far from Elizabeth) and did a quick search when I got home to find that the diner I ate at, Dan’s Diner in Spencertown, NY, was in fact a O’Mahony diner that this gentleman spent 12 years restoring. It is a beautiful place with an amazing, friendly staff. I would suggest looking them up. 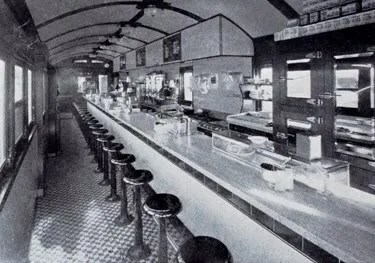 I believe The Smithsonian Museum has an O’Mahony Diner somewhere in their “attic.” Restorers may want to make inquiry. Any information on obtaining origianl advertising from the Jerry O’Mahony dining car company? We own a 1926. Just to let you know, I read on Facebook that the Harris Diner in East Orange N.J. just burned down. A classic diner. I would love to know if there is any info about an O;Mahony that was located in Woodmere, NY and then transported to the Morris Park yars of the Long Island Railroad in Jamaica NY. There is a O’Mahony diner at the bridge going Northwest to Woodstock, Vermont…found it on my way to see my old uncle Billings farm (national park now). The diner has a neon clock on it and is now attached to a larger restaurant structure. I am currently doing a full sheet cp watercolor of the inside. Is there a list of O’Mahoney diners in the NJ/NY/PA area? I am a painter living in Central NJ and have done a number of paintings of the Summit Diner – you can see them on my website http://www.lindaschwartzpastels.com. I would love to photograph and paint more O’Mahoney diners in this area. Check out the books “Diners of New York” and the second edition of “Diners of Pennsylvania”, both from Stackpole books. You might also consider the Worcester Lunch Car Company of Worcester, MA which also built “dining cars” from 1906 thru 1957. The Miss Worcester Diner is still a diner and operates across the street from the original plant today.